For those of us following the world of multilateral environmental agreements and policy making, the busy season is here once more. A major focus of many upcoming events will be Africa’s sustainable development and environmental wellbeing. From giant conferences like the UN climate change meetings in Nairobi in November, to a slew of smaller workshops and meetings covering issues as diverse as chemicals management and desertification, African countries are playing host to a wide array of meetings in the coming weeks and months. Budapest, 1 October 2006—The fifth session of the Intergovernmental Forum on Chemical Safety (IFCS) has concluded following lengthy discussions on the Forum’s future. The latest session, held from 25-29 September, ended with agreement on the need to avoid duplication of functions between IFCS and the recently-adopted Strategic Approach to International Chemicals Management (SAICM). Other topics discussed included toys and chemical safety, and heavy metals. Full Story. 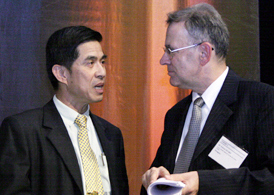 Photo: Previous IFCS President Suwit Wibulpolprasert (left) and President-elect Zoltán Szabó. Monterrey, 4 October 2006—Ministers from the world’s 20 major polluters have held talks in Mexico aimed at cutting greenhouse gas emissions. The meeting in Monterrey, which took place from 3-4 October, was the “second Gleneagles Ministerial Dialogue on Climate Change, Clean Energy and Sustainable Development,” a process established during the UK’s recent term as president of the G8 in 2005. Full Story. Montevideo, 28 September 2006—A high-level meeting on energy security in Latin America has concluded with agreement on first steps towards a regional observatory that will facilitate information sharing related to renewable energy technologies. The event took place ahead of the Iberoamerican Summit, scheduled for November. Full Story.